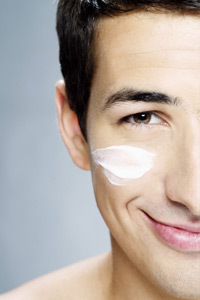 The article lists out which types of products in the male beauty category are best sellers in China (creams and moisturizers from gf); France (French fragrance brands like Le Male by Jean Paul Gaultier or 1 Million by Paco Rabanne and hydrating/exfoliating face creams from Sephora); and the US. Seems like guys from the US are into their skin, teeth, and colognes. Top sellers in the fragrance category came out to be the clasics like Acqua di Parma, Dolce & Gabbana’s Light Blue, and Armani’s Acqua di Gio. Sounds about right — I have yet to find a guy who isn’t currently going through — or at least have recently gotten over their — Acqua di Gio phase. Good cologne, but why not expand your horizons to one that, you know, doesn’t smell like every other guy? Hint: Lacoste, Givenchy Pi, Burberry Brit, John Varvatos. Or Gucci by Gucci for James Franco spoof on his own cologne alone. omg i definitely agree about the white teeth. europeans don’t give that enough importance. I have definitely heard that men are just as much – if not more at times – into beauty products than women. Trust me, my brother is a case in point. One day I will try to document his getting-ready process.